Small children, from birth to 7 years of age, pose special challenges in the treatment of their scoliosis. In these patients, growth of the spine and the lungs via the ribcage are intertwined, and must be maintained. Causes can be infantile or juvenile idiopathic scoliosis, congenital scoliosis and rib fusions, or neuromuscular or genetic syndromes, or connective tissue disorders. In these patients, initial attempts to control the scoliosis and maintain ribcage and lung growth can focus on observation, bracing, or casting, though one downside of bracing and casting is that braces and casts push on the ribcage as it grows. If this is not successful in progressive curves, then a variety of growth preserving procedures can be attempted, including growing rods, Shilla procedures, titanium rib or vertical expandable prosthetic titanium rib (VEPTR), or a stapling or tethering procedure. However, as their name implies, these growth preserving procedures may need multiple repeat surgeries to maintain growth, but this sometimes is the only way to maintain thoracic growth and lung function. This 3 year old girl with Ehlers-Danlos syndrome and multiple neurosurgical and orthopedic issues had a 120 degree progressive scoliosis. Initial treatment with growing rods is shown. Congenital scoliosis is a spinal deformity with lateral deviation and rotation of the spinal column caused by birth defects in the embryonal development of the vertebrae leading to the formation of one or more deformed vertebrae. The incomplete formation of the vertebrae results in asymmetrical growth of the spinal column. Congenitally anomalous vertebrae can occur in any part of the spinal column. Formation defects, segmentation defects, or combined forms of vertebral anomalies disturb the normal growth pattern of the spinal column, so that a scoliosis may develop as the spinal column develops. Congenital scoliosis is rare, but may require early surgery due to the severity of the spinal deformity. 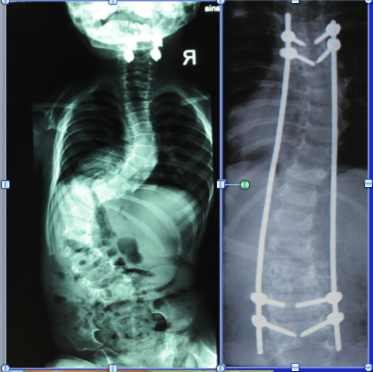 This 13 year old boy had a congenital hemivertebrae and anterior failure of formation at L1 giving him a 45 degree scoliosis and a 70 degree acute kyphosis. He was feeling worsening pain with time. A complex osteotomy of his spine was performed, resecting the hemivertebrae but also correcting the kyphosis, with reconstruction from T11 to L3. 3 years later he has no back pain, no deformity, and has no physical limitations. This term describes a clinical picture resulting primarily from neurological or muscular diseases and characterized by a wide variety of symptoms of varying degrees of severity (for example disorders affecting posture and the locomotor system or damage to sensory perception functions). Many of these diseases have their onset in childhood and may, in addition to the many individual primary symptoms observed, also lead to the formation of a scoliosis due to the neuromuscular disturbance of the postural apparatus with local or generalized muscular dysfunctions. Examples include cerebral palsy, myelomeningocele (spina bifida), Duchenne's muscular dystrophy, spinal muscular atrophy, Charcot-Marie-Tooth, and Friedreich's ataxia. This 16 year old boy with severe total body cerebral palsy had a progressive scoliosis to 135 degrees, pelvic obliquity, and kyphosis. This was preventing him from sitting in his wheelchair and making nursing care difficult. A single posterior approach with multiple osteotomies leveled his pelvis, corrected his curve. At two year follow up he sits comfortably, straight, and nursing care is facilitated.